LUVERNE receiver hitch steps provide a convenient stepping surface on the front or rear of the vehicle, using your vehicle's trailer hitch. A hitch-mounted design allows them to be attached or detached as needed, and the shank is able to fit any standard 2" x 2" receiver tube opening. 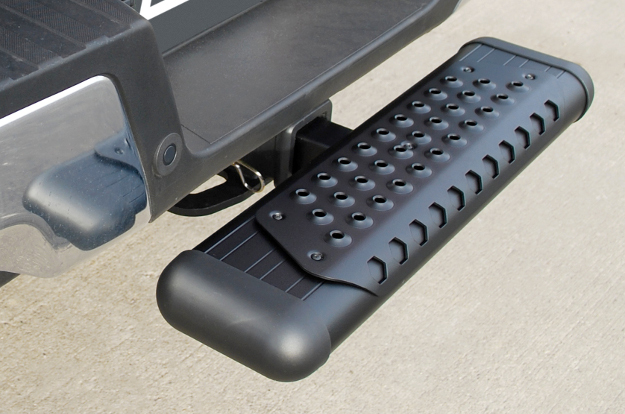 Each receiver hitch step is essentially a 26" version of our popular running boards. Styles include our Grip Steps™, MegaSteps® and O-Mega II™ side steps. These receiver hitch steps are available in complete kits with the step, receiver hitch mount and hitch pin included. For an extensive selection of vehicle-specific, made-in-USA trailer hitches, please visit our fellow brand CURT. 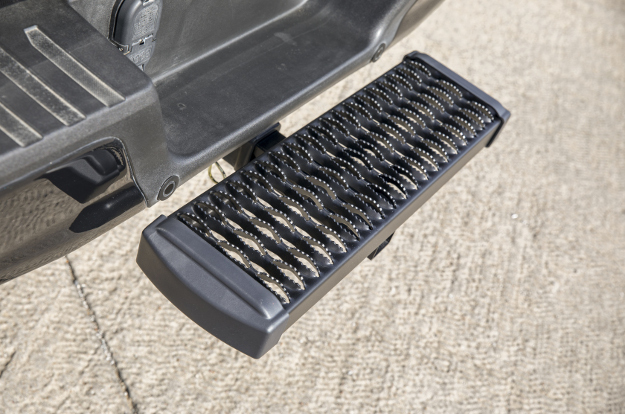 The Grip Step™ receiver hitch step features a unique, expanded metal tread for superior traction in any type of weather. It also has a 7" x 2-1/2" rectangular design to offer reliable footing, and it is built from aluminum alloy, making it exceptionally strong and rust-free. This receiver hitch step is made right here in the USA and can be mounted using the standard shank option or with a 6" drop shank for particular large, lifted trucks. The MegaStep® receiver hitch step combines the style of a nerf bar with the comfort of a running board. It has a 5" wide, non-skid rubber tread that extends the full width of the step to offer safe, secure entry. 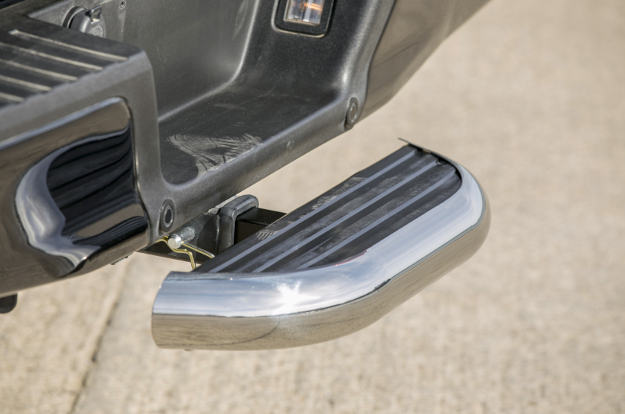 The MegaStep® hitch step also features a strong, lightweight aluminum core with a high-polish stainless steel trim for a bright, clean accent on your truck or cargo van. These receiver hitch steps offer the ultimate in durability and aggressive style for work vans and pickup trucks. They are built from lightweight, T6 aluminum construction, covered in a durable powder coat and finished with paintable TPO end caps. The O-Mega II™ hitch step features a non-skid aluminum step pad with raised, circular treads for superior traction in any weather conditions. The O-Mega II™ style is available in a black hitch step or silver hitch step option.